SURTRADE is a new multi-year cooperation project including a living lab in the city of Leipzig. It brings together scientists and practitioners and is supported by the German Federal Ministry of Education and Research. Shopping with the help of avatars, augmented reality and apps — according to the SURTRADE research project, this could be normality in the inner cities of Germany in the future. The project works on solutions for omnichannel trade. Smaller retail outlets should also benefit from the new opportunities. Omnichannel trade is wonderfully convenient for customers. They no longer make a clear distinction between stationary, online and mobile channel but decide how they wish to learn more about products, obtain or pay for them according to their needs. They often make the purchase decision wherever they find service is the best. This development, however, poses a great challenge for many retailers. The first applications researched by the SURTRADE project can already be tested under real conditions. Nov 9 to 17, 2018, a living lab is opened in Leipzig’s city center which is serving as a test field. Trying out On-site application and services at the living lab is expressly desired; e.g. buying furniture with the HoloLens: Look at pieces of furniture from all angles in a virtual space.Or shopping for clothes without trying them on: The digital avatar can be adjusted to your personal measurements. HHL is responsible for the evaluation of the living lab. “We interview the visitors about the individual stations of the living lab to find out which ones were well-received and where there is still room for improvement,” explains Eric Holdack, Research Associate at the HHL Chair of Marketing. The SURTRADE project partners expect active participation by Leipzigers in the living lab; and, consequently, findings about how they can continue to improve their offer to traders and customers. Another living lab will take place in Hamburg next year. Up until then, more services will be added. 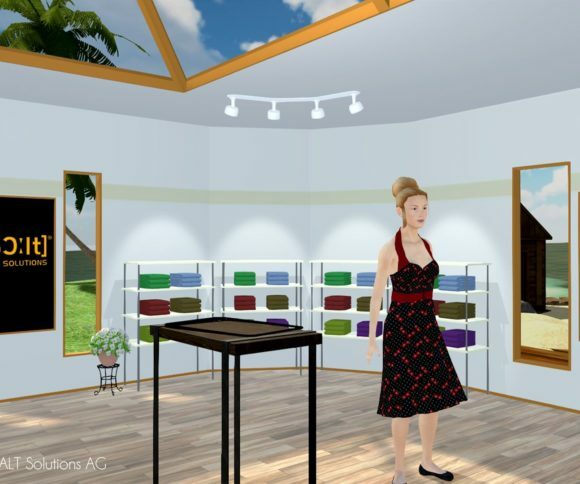 SALT Solutions presents an avatar to help with clothes shopping at the living lab. Instead of cramming themselves into small changing rooms and viewing the clothes in bright artificial lighting, customers can now leave trying on the items to a virtual personality thanks to the mixed reality technology. “You simply put on mixed reality goggles, a so-called HoloLens, adjust the avatar to your own body measurements and can then view different cuts, designs and color combinations,” explains Gunter Teichmann, Head of Innovation and Research at SALT Solutions AG. The virtual self appears to be right in the middle of the room. “We are also working on having the avatars advise the customers in the future,” comments Teichmann. They are to give recommendations on models and colors based on previous purchases. At the living lab, this information relates to the Tchibo coffee specialties. The company stocks a shelf with selections from its product range in Leipzig and offers a free drink to all visitors of the living lab at its coffee bar. “The beacons allow us to make our products tangible for the customers on other levels as well,” says Michelle Trella, Junior Process Manager of Cross Channel Marketing at Tchibo. “We are very excited to see how the customers will react at the living lab.” Customers can create their own individual coffee drink thanks to the QBO coffeemaker which can be controlled either by an app or Alexa. At the end of a shopping day, CheckMobile offers a solution for home delivery. The purchased goods are delivered free of charge — even from different shops, among them two Tchibo stores in Leipzig’s city center. “The goal of SURTRADE is to create a novel and positive shopping experience for customers,” says Janine Dulitz, Head of Professional Services at CheckMobile GmbH. “This includes them not having to carry their bags all over town.” CheckMobile GmbH is one of the leading technology companies in the strongly growing market for mobile process control and digitalization solutions. Join the HHL team and their SURTRADE partners in the living lab. If you are interested in the results and a follow up, please, contact Eric Holdack, Research Associate at the HHL Chair of Marketing.